California's newly sworn-in governor didn't waste any time tackling one of his key campaign pledges: expanding health care access in the Golden State. Gov. Gavin Newsom rolled out a package of health care proposals and policies a few hours after his inauguration, including an executive order to create a new California surgeon general, and another that would consolidate the state's prescription drug negotiating power. Right now, state health care programs like Medi-Cal for low-income Californians, CalPERS for retirees and the prison system all negotiate drug prices separately. Gov. Newsom's order directs state agencies to bargain together, and opens the door for private employers to join them, creating what Newsom's office calls the "biggest single-purchaser system for drugs." The new governor also wants to expand subsidies to help people buy medical coverage through Covered California — the Affordable Care Act marketplace — by both increasing the amount of financial assistance given to current eligible families and expanding access to middle-income families. Under the proposal, individuals who earn $72,000 a year, and a family of four that earns $150,000 could qualify for subsidies. Newsom also wants to give undocumented young adults the ability to stay on Medi-Cal, the state's Medicaid program, longer. California already covers undocumented children through Medi-Cal until they turn 19. Newsom's proposal would extend that to age 26, which is a compromise with health advocates who wanted coverage for all undocumented adults. Because the Affordable Care Act prohibits the use of federal funds to cover people in the country illegally, the entire cost of the Medi-Cal expansion would be shouldered by the state — one reason former Gov. Jerry Brown declined to allocate money for this during his tenure. The expansion of Medi-Cal and the marketplace subsidy changes will all be part of Newsom's first state budget, set to be unveiled Thursday. In a statement, Newsom said he would pay for the expansions in part by restoring the individual mandate — the requirement that all adults carry health insurance — something Congressional Republicans eliminated with the passage of their tax bill in late 2017. 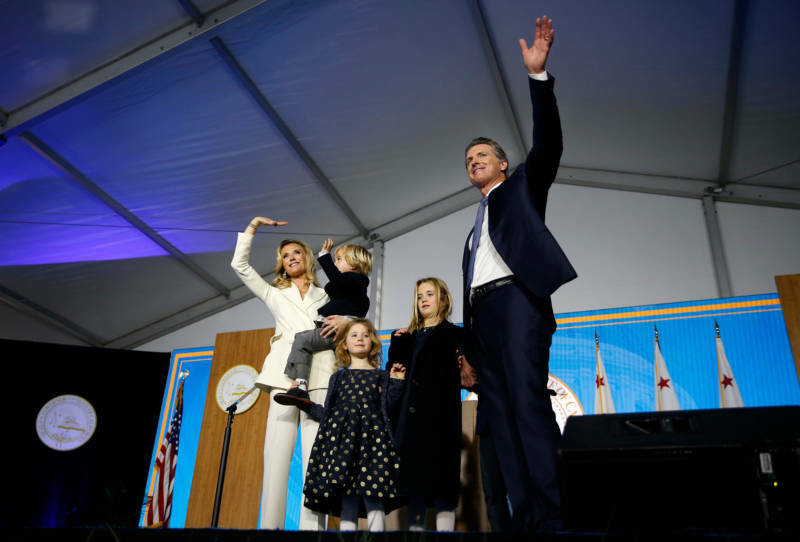 "Every person should have access to quality, affordable health care," Newsom said in his inaugural address. "Far-away judges and politicians may turn back our progress. But we will never waver in our pursuit of guaranteed health care for all Californians. We will use both our market power and our moral power to demand fairer prices for prescription drugs. We will stop stigmatizing mental health and start supporting it. And we will always protect a woman's right to choose." Health care advocates cheered Newsom's proposals as steps in the right direction. "Our health system is stronger when everyone is included. These steps outlined today would put California on an aspirational and achievable path to universal coverage," said Anthony Wright, executive director of Health Access California. "Last year, voters supported Governor Newsom in a health care election, and were clamoring not just to protect their care, but for the real, tangible steps to improve access and affordability to care."